A GL Atlanta teamed up with various local businesses in the Logistics Industry and quickly put together supplies for Louisiana flood victims. “We were given the opportunity to help out. The Humanitarian Support Foundation always tries to be a good neighbor and give aid whenever possible” says Mike Shea. 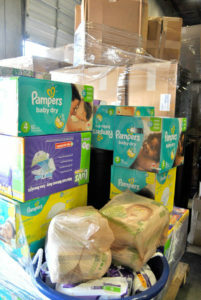 Mike coordinated and delivered boxes of baby supplies to a local warehouse for loading into a 53-foot trailer. Over 30,000.00 pounds of supplies were collected and trucked to Louisiana. Heavy rains in August caused massive flooding in Louisiana, and is considered the worst natural disaster in the U.S. since superstorm Sandy struck the East Coast in 2012. Thousands lost their homes and businesses. One parish reportedly had 31 inches of rain in just 15 hours. Louisiana’s governor estimated the floods have caused more than $8.7 billion in damage. The Humanitarian Support Foundation’s employees are committed and involved in volunteering, donations and working with charities beyond state borders.